Last Yom Kippur I sat on my couch and wept. What happened to my Jewish life, I wondered. My husband actually went to work. I could have gone to the lovely temple here but I chose not to. I have friends who invited me to their places of worship but I declined. I guess I just hadn’t thought through how doing nothing on the holiest day of the year would feel. If you ever hear me lecturing on the evils of how modern technology has corrupted our culture you have permission to wag an accusatory finger at me. Because I did in fact stream her rabbi, and it was so beautiful I called my sister in Virginia and she streamed the rabbi and we sat on our collective couches, listening in on a service in a synagogue in New York city. So here it is Yom Kippur again — and again I am not sitting in the burgundy velvet seats, listening to the hidden choir up above and watching the davening old men of my youth. The ritual of Tashlich at Rosh Hashanah, throwing bread crumbs into the water, naming my sins one by one, and setting the intention for next year that I will live my true self jump starts my season. But Yom Kippur deepens my life. And I have no plan. I can hear my orthodox grandparents: How could you not be in shul (synagogue) on the most spiritual day of the year. 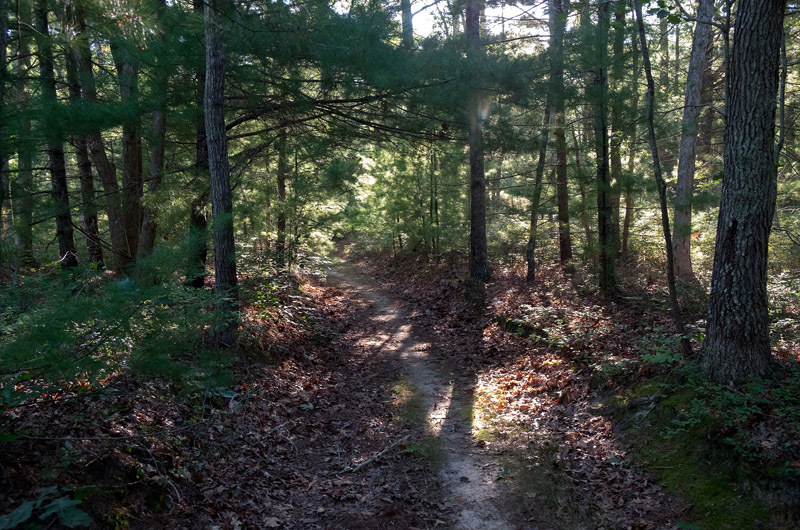 I drive to one of my favorite trail walks on the Vineyard, and the second I step foot in the woods I have a memory from when my son Dan was bedridden and had been for a long, long time. Dan was sick with MS for 16 years. Often when I went down to his house, we would watch a movie and then we’d talk and then I’d read to him and all would be well. At other times he would be so miserable and angry that I would spend the time reassuring him that what he was doing was impossible, and that most people wouldn’t be able to keep their humor and their sweetness, and who knows what cures were down the pike. But on the day in question he greeted me with very dark energy and these words: “I’m done. I’m finished. I’m not going to do this anymore.” I swallowed hard and said, what does that mean, you’re done. He said “I quit. I’m finished. I quit life.” I said I had to go out and take a walk and process this. I ran out of his house and into the nearby woods. I kept running until I couldn’t run anymore. Then, huffing and puffing, completely out of breath and sobbing, I finally stopped and looked around. I just stood there in complete silence. And I heard, I swear, I heard the trees actually speaking. I heard the words: “Follow his lead, Mother, follow his lead.” I walked slowly back, repeating the message. I told Dan when I got into his room how the trees had given me the advice, the wisdom and way through I had needed. I said Dan, they told me to follow your lead. So that’s what I’m going to do. I’m going to follow your lead. Dan looked at me with such gratitude. I will never forget that look. And in a very sober voice, he said thank you. A few days later he popped back into his charming, funny and almost-surrendered self. So here I am, walking up a steep hill in the middle of the most beautiful every-shade-of-green-possible woods, and I think, maybe I even say thank you. Then I say to myself, who are you thanking? God? The trees? Dan? And then I think, does it matter who I’m thanking as long as I am thanking. And then I realize my grandparents were from another time. I don’t need a synagogue. I don’t need a choir. I don’t even need those ancient men swaying to the minor key music. I am in my temple. I am with my teachers, the trees. Nancy Aronie lives in Chilmark. So heartfelt and beautifully written. Thank you Nancy. I remember a walk in the birch trees there on MV. It was a spiritual and place that has stuck in my memory for a long time. Thanks for sharing this story. I still think of Dan often and smile remembering his quick wit and bad jokes that would make me laugh but him more. gail diamond, roslyn heights, n.y.
What a beautiful tribute to your son ,Nature and the meaning of the holiday. Absolutely positively gorgeous and uplifting, Nancy Aronie!!! Tears. So beautiful. I can start my day now. Beautiful piece Nancy! Yes, the trees are my teachers and my temple too. Much love and peace to you in this new year. As I sit here this quiet morning, reminding myself that tonight is kol nidre. I have made no plans, I am comforted in your writing. For today, I can stream the rabbi from my childhood synagogue. Spiritually and metaphorically I will run through the trees and thank you for your gift today to remind me it's OK to do it my way. Happy new year. Sigh. You're the best. Love your writing, love your lessons. Soulful and wise, deeply lived and wonderfully told -- my heart aches and is enriched at the same. Tomorrow, I will be sitting on those seats in a NYC synagogue, wishing I were on the Vineyard, and thinking of you. Thank you for your beautiful and candid essay, which expresses the spirit of the holy day, and motherhood, perfectly. Thank you, Nancy for your deeply felt and beautiful words about your son, our world, your heart and what nourishes your spirit. You have touched a deep chord in all of us, especially those of us who no longer linger in the velvet seats and among the old men. My only sadness lies in wondering how the future Nancys and Lawrences will be built without that initial foundation. Nancy, this brought tears to my eyes. Thank you. Beautiful Message. Shared with my Friends. Thank You! Green wisdom, thank you for sharing this lovely story. Trees ask so little of us, but give us so much. Your writing always awakens the corners of my heart Nancy. Thank you for sharing ! Dear Nancy, do you know what I would have said if I said it? Of course you know, therefore there is no need to strain my poor brain and come up with more meaningful praise for your smorgasbord of limitless creativity talents and spreading love and beauty through everything you choose to choose. I am one (of many)who appreciate your boundless energy! I am looking forward to your next marvelous piece. A lapsed Unitarian, I worship on rivers shaded by towering trees, my cathedral built by God. Often, but not always, with a fly rod in my hand, and I seem to need no other comfort. I've experienced as a child the horror of World War II and have never recovered so I am unable to be observent or appreciate others good words. Yet, I am glad for those who derive comfort from whatever source they are given. My parents immigrated from their European countries to England because being Jewish meant discrimination and worse. They never recovered the financial comfort of which they were robbed. The English are anti-Semitic and that's why I immigrated to the U.S.A. I am joyful that my grandchildren are observant as their mother (my daughter) has taught them to be and they love their religion and its rituals. You circled back to how it all started all those thousands of years ago, Celebration is holy in whatever form, dear Nancy.